I've been measuring the levels of competence developed by cells growing in the RM defined medium (the 50:50 mix of the RPMI-based and MMB-based media). The messy graph below shows the results. Previous graphs I've posted recently have shown time course experiments, with cell density and transformation frequency plotted as functions of time, but this graph instead shows transformation frequency as a function of cell density. The blue squares are for cells growing in RM supplemented with inosine and the red squares are cells in the same medium without inosine. The triangles are cells in the same media with 1 mM cAMP added. The few yellow points are cells in the rich medium sBHI. What do we learn? First, there's a lot of day-to-day variation. 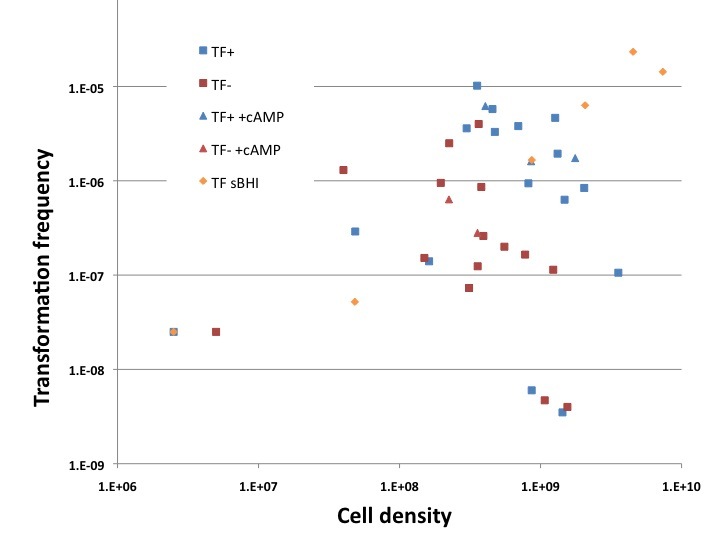 Second, there's not much correlation between cell density and transformation frequency; although most points show a weak positive correlation, some of the densest cultures have the lowest transformation frequencies. Third, cells growing in RM with inosine reach slightly higher densities and have slightly higher transformation frequencies. 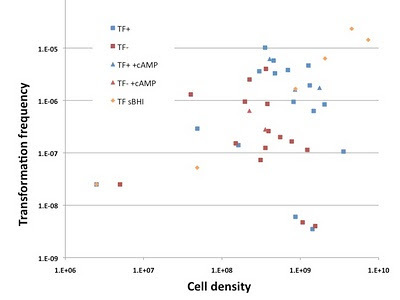 One clean result is that adding cAMP doesn't increase transformation frequency as it does for cells in sBHI. 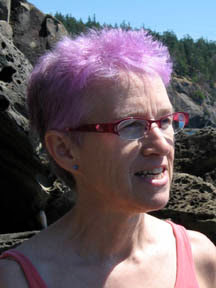 We know that the competence regulon is controlled by cAMP and CRP, both directly at the CRP-S-regulated competence promoters and indirectly by CRP-N control of the sxy promoter. So this new result suggests that cAMP levels may already be high in the defined media. One issue I still need to rule out is that the RM media might directly interfere with transformation. If it does, then the cells are actually more competent than we detect. I can check this by thawing out some of my frozen MIV-competent cells and resuspending them in BHI and in RM. In fact, I should go do this right now!